Developing services for Mrs. Helmi with the help of lean thinking. Mrs. Helmi is a well-known customer and neighbor among employees at Töölö comprehensive service center that comes under Helsinki’s Department of Social Services and Health Care. She was selected as a testee and first target of a new model, as the department’s key personnel began to rethink processes during lean training by Aalto University Profession Development (Aalto PRO). “We began by asking our customer first, Mrs. Helmi. She lives next door”, describes Marja Nurmi-Köngäs, director of Töölö comprehensive service center. In the business world, lean thinking means making processes streamlined and efficient, and the connotations can be the same in the public sector. Lean thinking at the City of Helsinki’s Department of Social Services and Health Care led to rethink Mrs. Helmi’s care plans. Several different care plans had been drawn up with different IT systems by the city’s different units, even within the same department. “I had some idea of lean thinking from automotive factories and other sectors, and had certain doubts about how it would fit in with the public sector. But we soon saw how well it worked”, says Nurmi-Köngäs. The training involved adopting lean methods in four full day workshops and a closing seminar. “They were full days with a rigorous schedule. At times, going back to work the next day felt like a nice thought”, reminisce Marja Nurmi-Köngäs and Helena Siltala, who coordinates daytime activities at the service center. Becoming familiar with the City of Helsinki’s other instances was a key element in preventing overlapping work and in the training as a whole. In addition to elderly services, child welfare and dental care experts delved into lean methods during the training. “It was really good to have people from the department’s different units. We are experts in elderly services, and get siloed easily”, describes Nurmi-Köngäs. 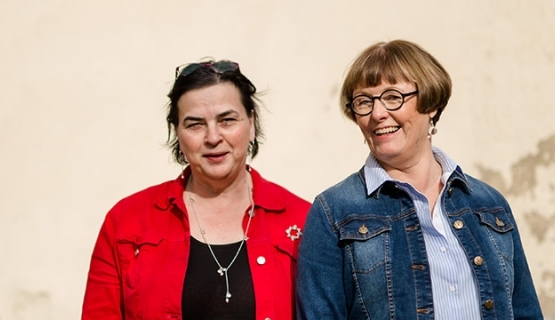 Both the director and coordinator at Töölö comprehensive service center hope to increasingly knock down barriers in public services. They are currently examining the prospect of opening up the service center for the elderly to children in the area. The elementary school in the vicinity has enquired about arranging physical education classes in the service center’s gymnasium.